Take action against illegitimate debt and together, let's stop the global debt cycle! Join Jubilee USA Network the weekend of October 14th for our Jubilee Weekend. In conjunction with Illegitimate Debt Week with our partners in the Global South, we can make a difference. Communities across the country and around the world will be taking action! Will you join us? Each year, Jubilee USA Network and our worldwide Jubilee partners come together to pray, worship and act in one global voice to further the participation of the most vulnerable in the international financial system. As the international debt crisis spreads from the Global South to the Global North, will you sign-up to organize a Jubilee event or add one Jubilee prayer or petition in your worship service? Click here to sign-up today! During this week of action, Jubilee USA Network hosts our annual Jubilee Weekend. Christian communities will host our annual Jubilee Sunday, which will take place on October 14th 2012. Jewish communities will host Jubilee Shabbat, and Muslim communities will have the opportunity to participate in our first annual Jubilee Jumah. Others will host Stand Up, Take Action! events. There are so many ways you can participate in the Jubilee Weekend of action. Incorporate one prayer into your service on the weekend of October 14th. Dedicate your entire worship service centered around Jubilee justice. Host workshops for all ages in your community. Organize a Stand Up Take Action event with your entire community. Click here for the resource. Make paper chains to be delivered to your Members of Congress. This year we are especially encouraging faith communities to plan interfaith events to make connections and relationships with your neighbors around global justice and continue to strengthen and diversify our network of faith communities. Plan a Linking Our Neighbors event. Have secular, interfaith and ecumenical prayers and reflection, share a meal and make chains as a united community to fight for justice. Click here for a resource. Jubilee USA Network is here to provide you with resources and support along the way. Feel free to contact us at (202) 783-3566 or at coord@jubileeusa.org. Sign up to be a part of Jubilee Weekend here! Pictures. 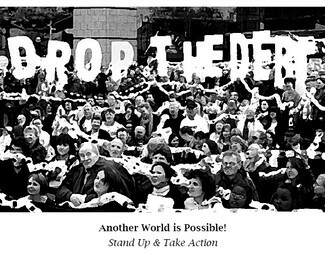 Take pictures of your community taking a stand in solidarity to urge your Member of Congress to stop the global debt cycle. These same pictures will be sent along to our partners in the Global South with a message of support! Please send them to coord@jubileeusa.org. These steps link us together with our brothers and sisters around the world and move us forward on a path of global economic justice. Together, we will provide the changes needed in International Financial Institutions to transform the economic system and allow for more opportunities of repudiation and cancelling of unjust debt! Click here to download the full Action Resource! Find out what other events are happening in connection with Jubilee Weekend by clicking the links! Illegitimate Debt Week, Jubilee Sunday, Jubilee Shabbat and Jubilee Jumah.